As Crew First Pilot - 5 missions -226 (12 Aug 1944), 227, 228, 230, 231; As Deputy Lead Crew Pilot - 3 missions - 235, 237, 245; As Lead Crew Pilot - 18 missions - 247, 248, 249, 250, 251, 254, 255, 258, 263, 266, 273, 275, 284, 288, 300, 320, 336, 348 (30 March 1945). No non-credited aborted missions. For Mission dates, targets and Mission Reports, see Combat Missions. Captain Hugh B Johnson (P)(POW) - First two mission (266, 267) flown as CoPilot with a combat Crew Orientation Pilot, 2Lt Ernest H. Whittal. Next six missions flown as First Pilot (228, 230, 231, 235, 237, 245). All other missions flown as a Lead Crew Pilot or CoPilot. Completed 26 credited combat mission on 30 March 1945 (Mission 348) when he became a POW. Was promoted from 1Lt to Captain on 29 December 1944 following his 22nd mission. 1Lt Harry S. Seidel (CP) - Flew on 13 missions with Captain Johnson (228, 230, 231, 235, 237, 245, 248, 250, 255, 258, 263, 266, 273) and five missions with other Pilots (251, 252, 253, 269, 275). Completed 18 credit mission on 21 November 1944 (Mission 275). 1Lt George F. Weber (N) - Flew on 14 missions with Captain Johnson: Regular Missions (226, 227, 228, 230, 231); Lead Crew missions (235, 237, 245, 248, 250, 254, 255, 263, 266). Flew on 17 missions with other Lead Crew Pilots (268, 269, 274, 281, 287, 292, 294, 299, 303, 310, 311, 318, 326, 331, 339, 342, 347). Completed combat tour (31 missions) on 28 March 1945 (Mission 347). Captain Raymond H. Gorham (B) - Flew on 14 missions with Captain Johnson: Regular missions (226, 227, 228, 230, 231, 245, 248); Lead Crew missions (249, 250, 251, 258, 288, 320, 336). Flew on 16 Lead Crew missions with other Pilots (243, 246, 253, 280, 297, 312, 316, 322, 324, 328, 330, 332, 334, 342, 354, 356). Completed 30 missions on 9 April 1945 (Mission 356). Promoted from 1Lt to Captain on 4 May 1945 after his last mission and end of hostilities. T/Sgt Eugene F. Edwards (E)(POW) - Flew on all of the 26 Captain Johnson missions. Last mission on 30 March 1945 (Mission 348) when he became a POW. T/Sgt Robert B. Carter (R) (POW) - Flew on all of the Captain Johnson missions except mission 273 when a substitute Radio Operator was used. Flew on one mission (347) with Lead Crew Pilot Captain Campbell Miller. Completed 26 mission on 30 March 1945 (Mission 348) when he became a POW. S/Sgt Joseph A. Blinebury (BTG/WG) - Flew on 13 missions with Captain Johnson: As Ball Turret Gunner (226, 227, 228, 230, 231, 247, 248); As Waist Gunner (235, 237, 245, 249, 251, 254, 288). Flew on 19 missions with other Pilots: With Capt Werner G. Goering - As Ball Turret Gunner - 262, 263, 265, 267, 269, 273, 274, 275, 277, 279, 285, As Lead Crew Waist Gunner (314, 315, 323, 327, 330); With others (266, 287, 326). Completed combat tour (32 missions) on 4 March 1945 ( Mission 330). Awarded the Soldiers Medal on mission #315, 15 February 1945, when he rescued 2Lt James C. Buckner (Mickey Navigator) on the 1Lt Goering Crew when the B-17 crashed shortly after take-off. S/Sgt George K. Reimche (WG/TG/Tog) - Flew on eleven missions with Captain Johnson: As Waist Gunner (226, 227, 228, 230 ,231, 258, 263, 275); As Tail Gunner (237, 248, 250). Flew on 17 missions with other Pilots: As Waist Gunner (263, 274, 281, 284); As Tail Gunner (266, 268, 269); As Togglier (286, 287, 289, 310, 312, 316, 350, 360, 363, 364). Completed 28 missions on 25 April 1945 (Mission 364). S/Sgt Harold P. Beck (TG/WG) - Flew on 18 missions with Captain Johnson: As Tail Gunner (226, 227, 228, 230, 231, 235, 245); As Waist Gunner (247, 248, 250, 251, 255, 266, 273, 284, 300, 336, 348). Flew on 7 missions with other Pilots: As Tail Gunner (275, 276, 277, 281); As Waist Gunner (314, 315, 347). Completed 25 missions on 30 March 1945 (Mission 348). Sgt Eugene J. Remolde (WG) - Deleted from crew before their first mission when crew size was changed from 10 to 9 men. Flew no 303rd BG(H) combat missions. Mission 255 - 11 October 1944 to Koblenz, Germany. The 1Lt Johnson crew was flying as the High (#2) Squadron Lead Crew. The Gee-H Deputy Leader took over the formation lead on the bomb run. The 1Lt Johnson crew flew as the #4 B-17, 2nd Flight of the #4 Squadron over the target and on the remainder of the mission. Mission 284 - 9 December 1944 to Stuttgart, Germany with Major L.M. Schulstad 41st CBW-B Air Commander and 1Lt Johnson as Lead Crew CoPilot. Passenger was Mr. Paul V. Connors, Correspondent for Stars & Stripes newspaper. Lt Johnson, on his 20th mission, and Lt Earl D. Metko (Lead Navigator) had all kinds of "soup" and clouds with which they were forced to attend. Lt Metko, known as the crew "Character" and 1Lt William D. Sachau (B) spent a portion of the return trip entertaining Mr. Paul V. Connors with a unprofessional rendition of "Roll me Over." Mission 288 - 19 December 1944 to Kall, Germany. 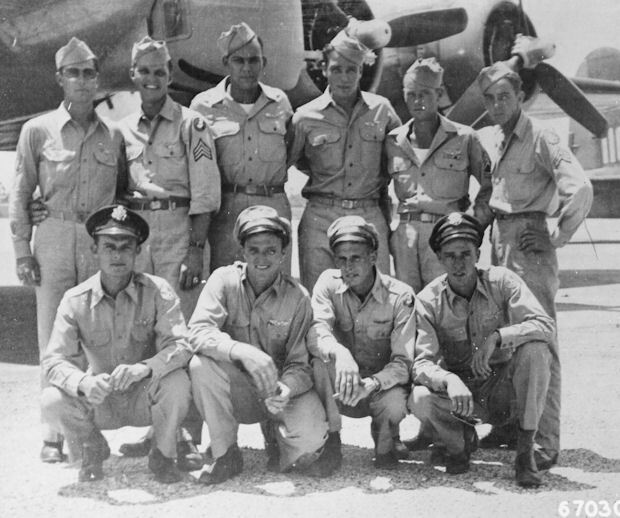 The 360BS High Squadron, led by 1Lt Roger L. Kuykendall, took over the Group lead from Capt R.J. Lynch (P) and 1Lt H.B. Johnson (CP) when Captain Lynch's PFF B-17G Gee-H equipment failed. Mission 300 - 10 January 1945. Mr. Paul V. Connors, Stars & Stipes Newspaper Correspondent flew on his second mission with the 1Lt Johnson. A lengthy article appeared under his by-line describing the 303rd BG(H) 300th mission in the 11 January 1945 issue of Stars & Stripes.